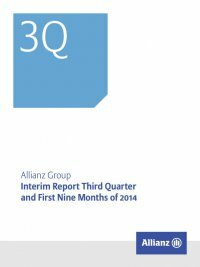 Interim Report Third Quarter and First Nine Months of 2014 Allianz Group28 Asset Management Third quarter 2014 −− Operating profit of € 694 MN. −− Cost-income ratio at 57.1 %. −− Total assets under management at € 1,872 BN – total growth of 5.8 % in the first nine months of 2014. −− Third-party net outflows of € 84 BN in the first nine months of 2014. Key figures key figures asset management1 € mn three months ended 30 September 2014 2013 Operating revenues 1,618 1,703 Operating profit 694 755 Cost-income ratio in % 57.1 55.7 Net income 438 482 Total assets under manage­ment as of 30 September in € bn 1,872 1,811 thereof: Third-party assets under manage­ment as of 30 September in € bn 1,411 1,404 Business segment overview Allianz offers Asset Management products and services for third-party investors and the ­Allianz Group’s insurance opera- tions. We serve a wide range of retail and institutional clients worldwide with investment and distribution capacities in all major markets. Based on total assets under management, we are one of the largest asset managers in the world that manages third-party assets with active investment strategies. Assets under management Development of total assets under management1 € BN 5000 1,000 2,0001,500 1,571 197 (79) 1,770 1 Market effects Net flows Consolidation, deconsoli- dation and other effects F/X effects Total AuM (as of 9/30/2014) Total AuM (as of 12/31/2013) 1,652 220 0 +100 +105 1,872 (23) Fixed income Equities Other Changes 1 Based on legal entity view. 1 Effective 1 January 2014, the ­Allianz Group allocated certain entities from the reportable segment Asset Management to the reportable segments German Speaking Countries, Western & Southern Europe and Growth Markets within the business segment Life/Health and to the reportable segment Banking.